AMES, Iowa — Hillary Clinton and her campaign team were on the defensive on Sunday after she cited the September 11 attacks and her ties to rebuilding lower Manhattan in response to criticism of her record with Wall Street donors. Her remarks came during the Saturday evening Democratic presidential primary debate in Des Moines, which focused heavily on foreign policy in the wake of the terrorist attacks in Paris. Clinton’s comments provoked immediate reactions ranging from bewilderment to outrage from an array of rival campaigns, political opponents, reporters and debate viewers using social media. The following day, at the Central Iowa Democrats fall barbecue, Clinton and her team sought to fend off attacks and questions about what she’d said on stage at the debate. The remark came after Clinton’s opponent, Sen. Bernie Sanders, I-Vt., questioned whether she could effectively regulate the financial industry despite having taken millions in donations from Wall Street. Clinton turned to moderator John Dickerson. “Well, John, wait a minute. Wait a minute, he has basically used his answer to impugn my integrity. Let’s be frank here,” she said. She went on to cite her experience representing New York in the U.S. Senate from January 2001 until early 2009. Later in the debate, when the moderators took questions from Twitter, Clinton was asked to respond to a message that suggested it was inappropriate for her to invoke September 11 in connection with a Wall Street fundraising question. “I am sorry if whoever tweeted that had that impression,” Clinton said. “It’s just an unfair attack,” Podesta said. Yahoo News asked Podesta whether Clinton planned the strategy of pointing to 9/11 to defend her Wall Street donations ahead of the debate. He suggested the remark was a spontaneous response to Sanders. According the Center for Responsive Politics, Clinton has taken nearly $13 million in campaign contributions from “securities and investment” donors since 1999. Sanders, a self-described “democratic socialist,” has made pushing for Wall Street regulation and campaign finance reform central parts of his campaign. He also has increasingly launched direct attacks on Clinton. At the barbecue Sunday, Clinton again mentioned 9/11, this time in the context of the tax policies of Republican former president George W. Bush and her own opposition to his tax cuts for the wealthy. Clinton was accompanied by her husband, former president Bill Clinton, at the event. Following her speech, both Clintons ignored multiple questions from Yahoo News about whether her comment about 9/11 in the debate was “exploitative” as she greeted members of the audience. Bill Clinton later told reporters the attacks on his wife for her relationship to Wall Street are not fair. “It is a stretch. Those of us who were there know that,” Clinton said. One of Hillary Clinton’s primary contest rivals, former Maryland Gov. Martin O’Malley, also spoke at the barbecue, calling her comment about 9/11 an attempt to “mask” her Wall Street ties. O’Malley then pivoted to Clinton’s remarks. He argued that Clinton is trying to hide her links to the financial industry. Speaking to reporters afterward, O'Malley doubled down on the criticism. He described Clinton’s comment as a "gaffe” that was particularly insensitive in light of the terror attacks in Paris that left over 100 people dead on Friday night. She was, “in a very, very distasteful way, trying to pump out a smoke screen for her coziness with the big banks of Wall Street, by invoking the tragedy of 9/11 and those attacks. 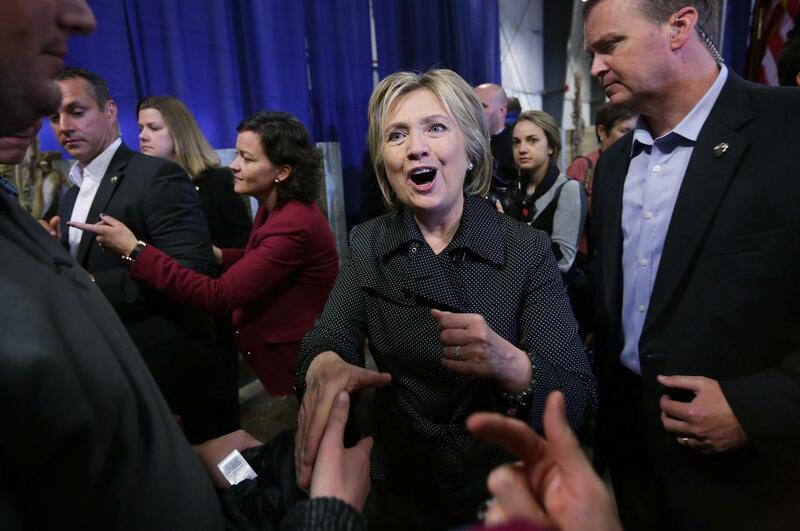 Especially so fresh after so many were murdered in Paris,” O'Malley said of Clinton.